Voting has closed and with a narrow margin of victory, the new South Bend Cubs mascot has been named Stu. SOUTH BEND, Ind. - After sorting through 350 names, submitted by 738 Facebook followers, it was up to the fans to choose between four names for the new mascot. 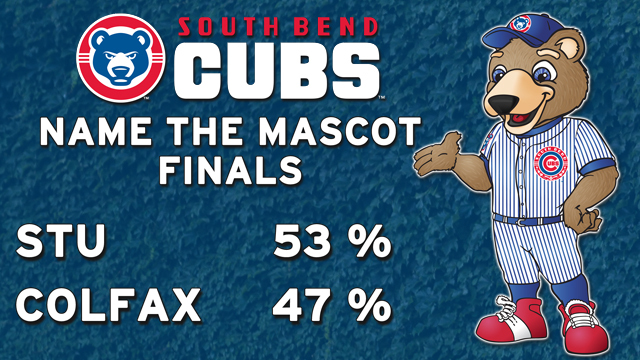 On Friday, February 20th at 5:00pm, voting had closed and with 53% of the votes, Stu has been selected as the new name of the South Bend Cubs mascot. Officially, the mascot's full name is Stu D. Baker in honor of the parts turned automobile manufacturer based in South Bend from 1852-1963. But to many, he will simply be known as Stu. With that, two winners have been selected in the Name the Mascot Contest as both names were proposed in the application process. The winners are Jim Brohman of South Bend and Angela Deak of Milford. "Throughout the contest there were many suggestions and great ideas from our fans," said Team President Joe Hart. "But at the end of the day, there could only be one name and we are more than happy with the selection by the fans." There were also many suggestions to honor Chicago Cubs legend, baseball pioneer and Major League Baseball Hall of Famer Ernie Banks who passed away on January 31, 2015. While his name may not have made the list, the South Bend Cubs do plan to honor Mr. Cub and all of his contributions to baseball this year. Stu will make his debut on Thursday, April 9, 2015 on Opening Day at Four Winds Field.